…or the journey to become a filmmaker… or spending time with serial killers makes for interesting dreams. In the next four months I will attempt to finish my newest film, “Romeo Must Hang,” self-distribute, “Adopt-A-Jesus,” and hope that “Shades of Gray,” which was picked up by Entertainment One hits store shelves. All while holding down my 40 hour a week job at WV Public Broadcasting. In the end this will be a handbook on “how to” or “how not to” make it in the film world. Failure is not an option!!! Over the course of 2010 I will attempt to document how all of this unfolds, the ups and the downs. Before I conform to a mundane existence in a day to day job I must make an attempt to make it in this world on my own. If I’m successful I’ll have a long career ahead of me telling stories through a lens and I’m inviting you to come along for the journey. The great Yogi Berra once said, “If you arrive at a fork in the road, take it.” My journey began with a trip to Clarksburg to read through the papers of one Gray Barker, that grew into a partnership and friendship with brothers Jeff and Bob Tinnell along with John Michaels and now a distribution deal with Media 8 / Trillian Entertainment and Entertainment One. I’ll fill in the back-story as we go along but for now, Ladies and Gentleman… Harry Powers. The year began with lots of snow and allowed plenty of time for pre-production on “Romeo.” Researching serial killers is not my cup of tea but the story of Harry Powers is a compelling one indeed. Who knows maybe I’ll get a good short-film out of a crazy dream or something? Research is always interesting for documentary films because you must get inside and become the best friend of your main character. Living subjects are easier because you can communicate with them, as for the Gray Barkers and Harry Powers you must have that dialog internally. Gray Barker wasn’t such a bad guy but Harry isn’t exactly someone I would seek out for friendship. Getting to know Harry means reading books about other murderers, (Gacy, Bundy, Gein, HH Holmes) this has allowed me to somewhat understand how Powers mind worked. 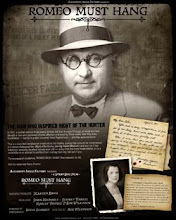 It has also brought other questions that will become themes in the documentary. Such as the consumer publics desire to watch as such atrocities play out in our 24 hour news of today, due-process and the death penalty. The challenge for me with all of my films is how to engage the audience in a intelligent conversation and at the same time entertain them with a compelling story. This is one reason you must become closely aquatinted with your subjects. 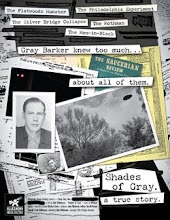 With Gray Barker, “Shades of Gray,” I read through his papers and person correspondence, with Harry Powers, “Romeo Must Hang,” I read the newspaper stories, his court transcripts and I studied others like him. 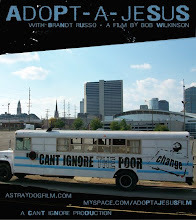 With Brandt Russo, “Adopt-A-Jesus,” I spent time on the road with him living his lifestyle and we became friends. Once you find a good story that has a character who is complex the next step is to get to know them. Next for me it’s off to Buffalo, NY to interview David Schmid, author of “Natural Born Celebrities.” The edit system is also due to be here in the next couple of days. After 7 years of editing on an Avid it’s time to learn final cut and the Mac OS. Makes the journey all that more interesting, hope you’ll come along with me and we can have a dialogue at this fork in the road. Labels: "astraydogfilm", "Brandt Russo", "Gray Barker", "Harry Powers"